President Herbert Hoover sent the telegram that unveiled the Lincoln Statue in 1930. Over 40,000 people gathered in Spokane on Armistice Day to view the bronze statue that many had contributed donations to help build. As early as 1922 the Lincoln Memorial Association was created in Spokane to organize the creation of an Abraham Lincoln Statue. 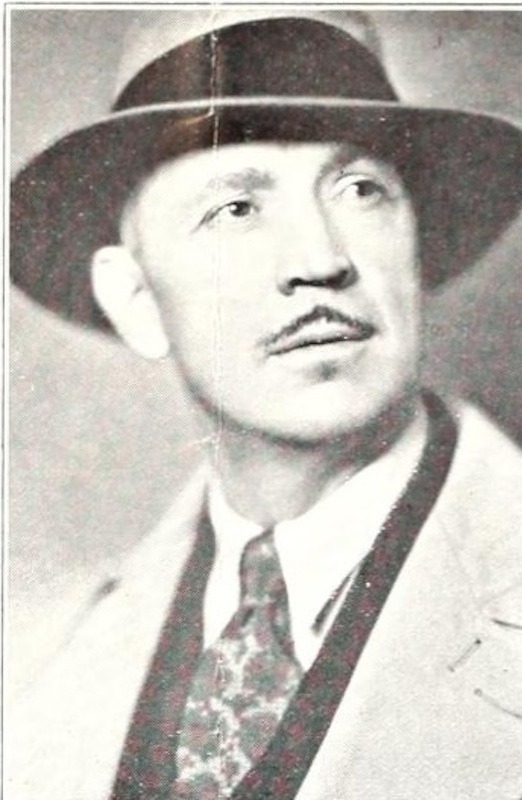 The Lincoln Memorial Association commissioned University of Washington professor, Alonzo Victor Lewis for the project. The cost was set at $25,000 and the Association set to work fundraising. The group had originally hoped to raise the money in one year, but it took eight. Lewis briefly lived in Spokane, and even though many cities were interested in buying the sculpture of Lincoln, Lewis was willing to work with the Association to raise the remaining funds for a few extra years. The statue was placed in the heart of Spokane's downtown, on the corner of Monroe Street and Main Avenue. Lincoln stands 12 feet high, and resides on a base of ten feet. The scale of the statue is impressive. 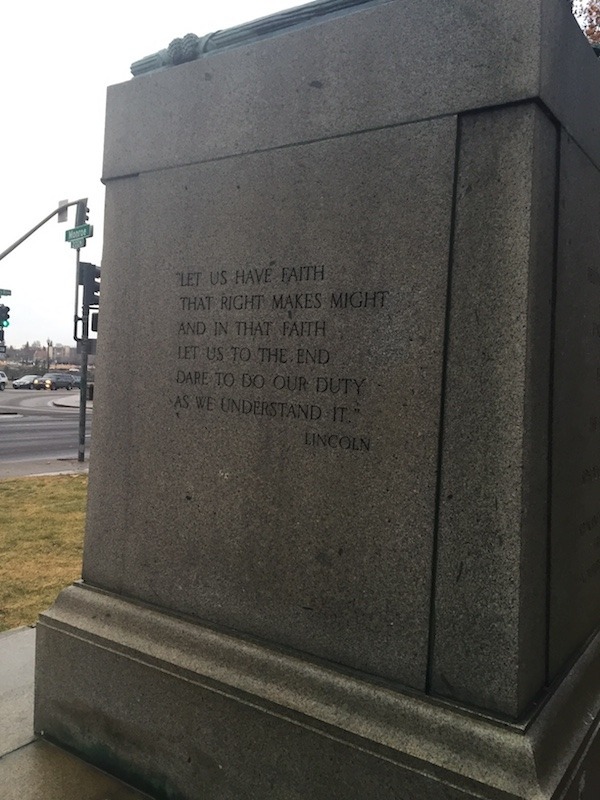 Two short quotes from Lincoln are etched in the base, one on his right side and the other on his left. This statue is said, by the Spokesman Review, "to be the only statue of Lincoln protraying him in his role as commander-in-chief of the Union Armies." At one point Lewis owned the clothes that Lincoln was assassinated in, and supposedly based the clothes Lincoln is wearing in the statue upon them. The Lincoln Statue experienced quite a bit of action in the 1960s. 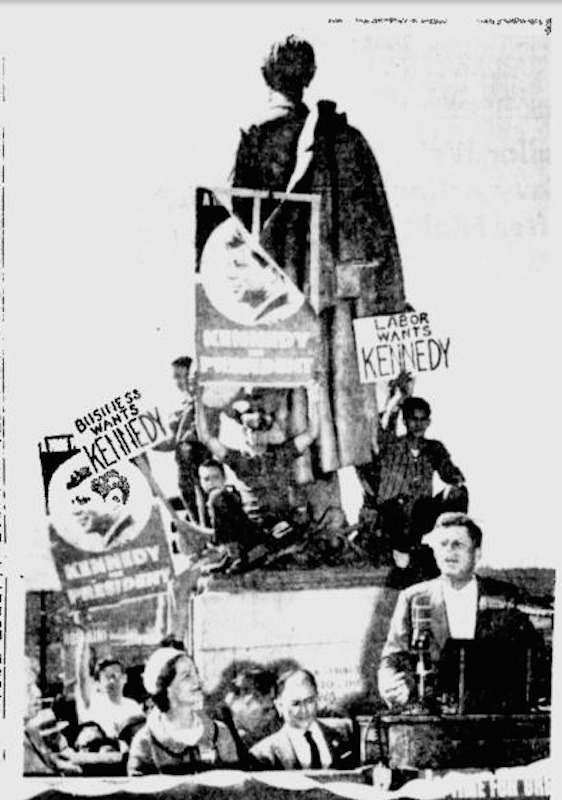 Senator John F. Kennedy stopped in Spokane four times during the 1960 presidential election and on September 6, 1960 he gave a speech at the Lincoln Statue. Thanks to funding from a local penny drive, in 1967 the statue was moved 30 feet east of its original location for a traffic revision. And in 1968 following the assassination of Martin Luther King Jr., a group of civil rights activists held a march ending at the Lincoln Statue. 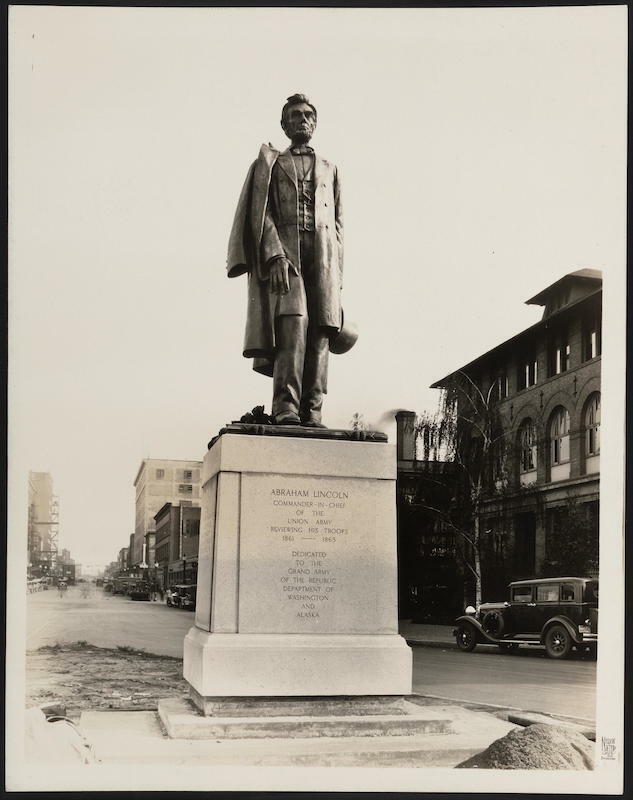 The Lincoln Statue: This undated photograph of the Lincoln Statue was taken before the statue was moved in 1967. Image courtesy of the Library of Congress, Rare Book and Special Collections Division, Alfred Whital Stern Collection of Lincolniana. Kennedy Speaking at the Lincoln Statue, 1960: Robert F. Kennedy gave a speech at the Lincoln Statue on September 6, 1960. The senator made four trips to Spokane in his 1960 run for the presidency. In this photograph looking at Kennedy, we see the back of the Lincoln Statue. Image courtesy of the Google Newspaper Archive. 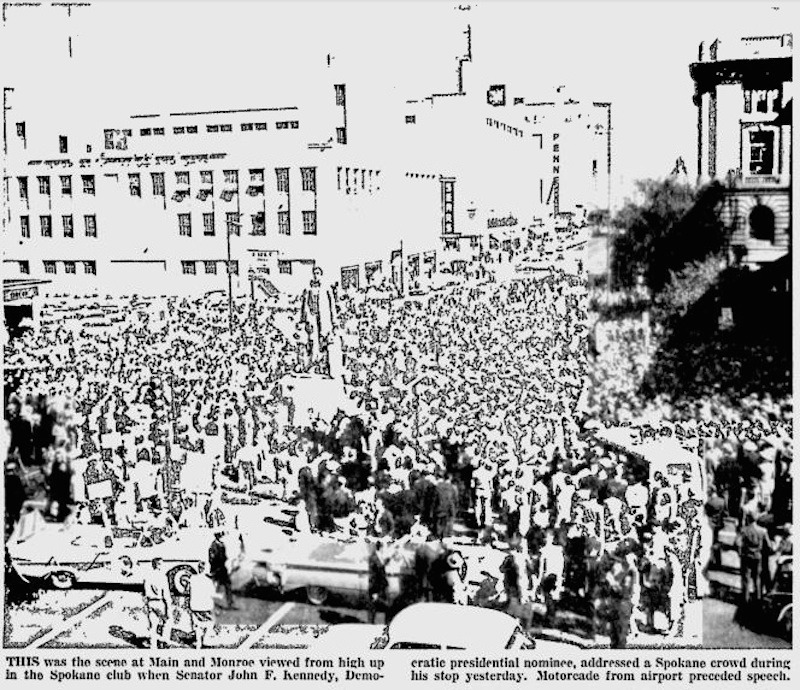 Crowd at Kennedy's Speech, 1960: This image gives another view of Kennedy's speech at the Lincoln Statue, September 6, 1960. Abraham Lincoln standing high above the crowd. Kennedy would have been on the other side of the statue. Image courtesy of the Google Newspaper Archive. Alonzo Victor Lewis: This University of Washington professor sculpted Spokane's Lincoln Statue. He lived in Spokane for a short time and went on to create numerous works of art throughout the country and the Northwest. Image courtesy of the Internet Archive. Front of the Lincoln Statue: Standing at twenty two feet, the height of the statue is impressive. After the statue was moved in 1967, it stands alone on an island at one of downtown Spokane's busiest intersections. Image courtesy of Allie Honican. Quote on the Base of the Statue, Right Side: This quote by Abraham Lincoln is on the base of the statue on Lincoln's right side. Image courtesy of Allie Honican. 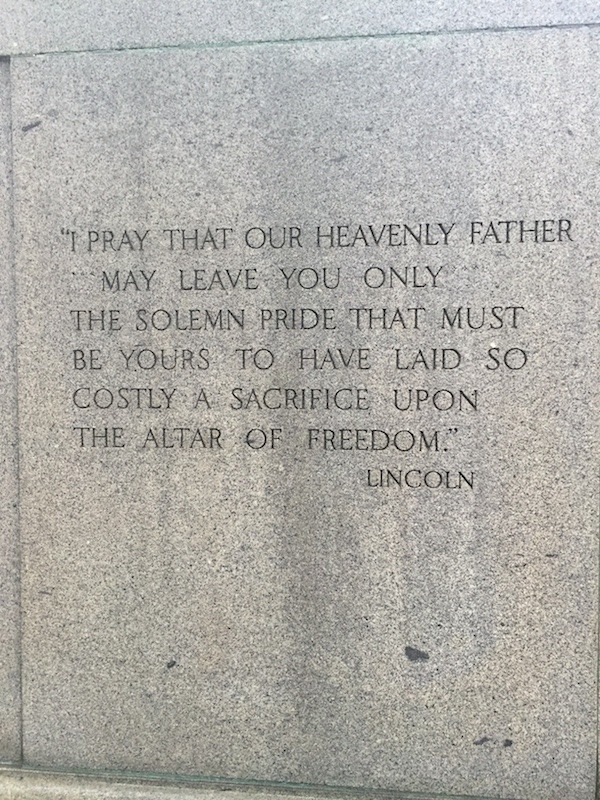 Quote on the Base of the Statue, Left Side: This quote by Abraham Lincoln is on the base of the statue on Lincoln's left side. Image courtesy of Allie Honican. 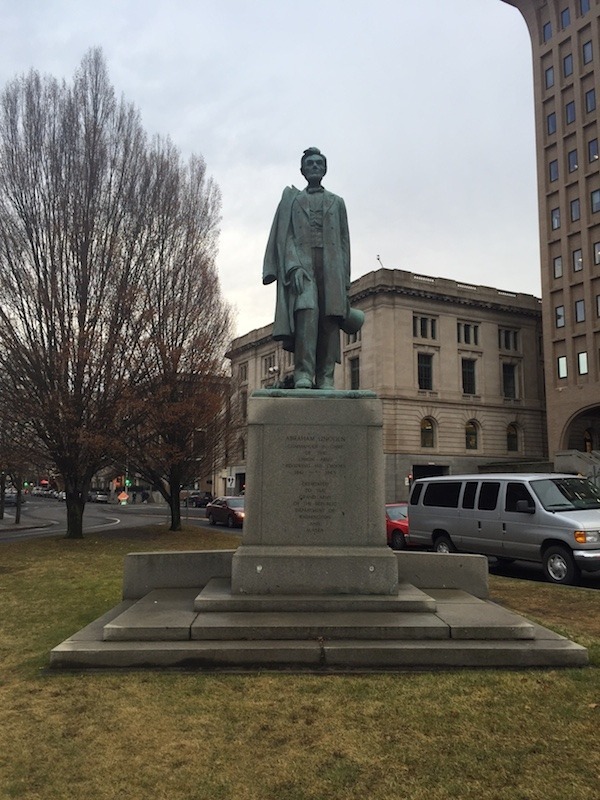 Allie Honican, “The Lincoln Statue,” Spokane Historical, accessed April 19, 2019, https://spokanehistorical.org/items/show/506. Mitchell, Stephanie. Spokesman Review. "Statue's Unveiling in 1930 is Recalled." February 12, 1969. Spokane Daily Chronicle. "Crowds Welcome Kennedy," September 6, 1960. Spokesman Review. "It's Time for Abe to Move -- 30 Feet North-Northeast," October 19, 1967. Spokesman Review. "Kennedy Greeted by Large Crowd," September 6, 1960. Spokesman Review. "Lincoln Statue Plans Progress," February 2, 1923. Spokesman Review. "Proposed Lincoln Memorial for Spokane," October 1, 1922.